As we continue to bask in the excitement of J.O. nationals, we’re trying to break down the results for you in as many ways as possible. Before the meet, we reported Auburn qualified the most recruits to the meet. 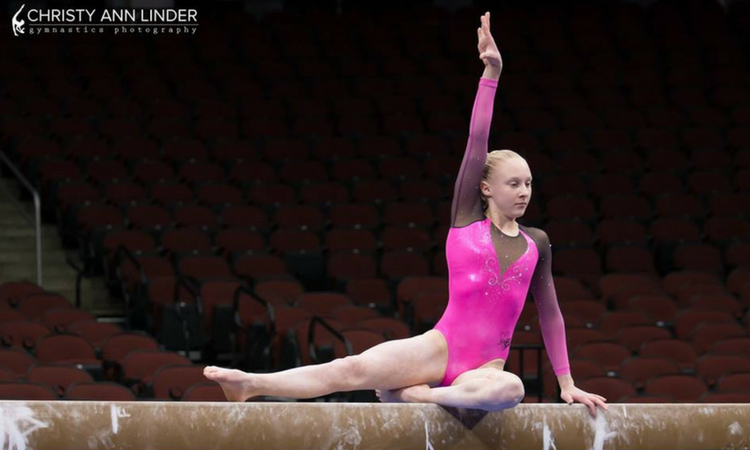 This got us thinking: While there were many winners on paper, we thought we’d break it down College Gym News style and see which states, clubs and future NCAA teams “won” nationals based on their gymnasts’ performances. Sometimes even random metrics can yield information and truth about potential future trends. We assigned a point to each top-three finisher and came up with our winners. Some gymnasts obviously earned multiple points for their NCAA team, club gym and school. Here are the podium finishers. NCAA Team: You’ll notice Alabama’s and Missouri’s points were each earned by one gymnast (Makarri Doggette and Helen Hu, respectively). While both athletes still have one more year before they join their college teams, look for them to make a big splash in the NCAA. It’s also interesting to note that the second place group went to athletes who haven’t announced their college decision yet. From a recruiting perspective, this is quite exciting as it means there is plenty of talent still out there to recruit. Some of these athletes are still very young (and we want to stress that they still have PLENTY of time to make a college decision), but it will certainly make for an exciting next few years if these athletes are already performing this well among the top senior athletes. Additionally, many teams that had a high number of athletes competing didn’t factor into the top three as often. Most notably: Nebraska, Oklahoma, Oregon State and Auburn. Here are the number of athletes that the top schools had competing at this meet. Club Gym: Once again, Doggette and Hu both notched multiple points for their gyms, single-handedly helping Buckeye and IK Gym secure the “win.” Andrea Li and Gabryel Wilson carried both the Legacy Elite and Olympia teams, respectively, to a second place finish while Rachael Lukacs and Kaylee Quinn teamed up for North Stars. Carly Bauman helped Chow’s sneak into the No. 3 spot. For J.O. nationals, quantity didn’t necessarily equal numerous top finishes. Metroplex had 13 gymnasts competing and Texas Dreams had 12, but Metroplex didn’t break into the top three while Texas Dreams did only once thanks to Colbi Flory. We’ve spent a lot of time talking about individuals, but we all know NCAA is a team sport. We thought it would be fitting to simulate “team finals” data with each gymnasts’ score counting towards the score of her future school. To get the total score, we took the top three scores of each schools’ recruit, averaged them and then multiplied that by three to get the score for the event. Breaking it down: While we know many of the top recruits weren’t at this meet (i.e. elite athletes, injuries) this list does make us think about some potential new trends in the future of NCAA gymnastics. Given the parity in college gymnastics, particularly in recent seasons, there is always a potential for some drastic ranking shifts, and it will be interesting to see if these numbers are any indication of what’s to come. Teams that outdid themselves: Pitt, which finished the 2018 season ranked 30th, finished fifth in our team final, marking the most noticeable jump in the standings. Another surprise was UNC, who disappointingly finished out of the top 36 in 2018. Its performance at J.O. nationals indicates the strength of its future recruits. California and Michigan finished commandingly in front of the rest of the teams here, which suggests their recruiting classes are indeed as strong as they have appeared on paper. Surprisingly low finishes: UCLA, Florida and LSU—who finished the 2018 seasons ranked first, third, and fourth, respectively—are noticeably absent from our team finals standings. Oklahoma, who finished 2018 in second, is in 10th place. These are teams who typically recruit more elite athletes than other teams, so their low finish is not a red flag but still something to note. 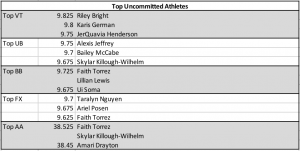 Looking Forward: There is typically a big recruiting boom after nationals, and we thought it might be fun to see how the “uncommitted” gymnasts did, especially since they factored so heavily into the overall rankings. Of course verbals are non-binding and maybe things have changed, but Amanda Cashman has been publicly listed as a Utah commit for some time. Isn’t Cashman still considered a Utah commit? Would that change your rankings at all?